Click the numbers below to view the answers. 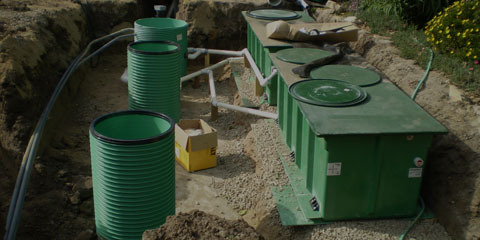 OWTS stands for Onsite Wastewater Treatment System, which is a private sewage treatment system. 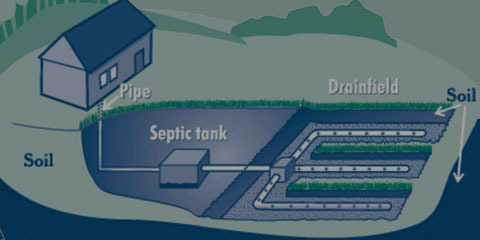 Historically, these systems have been known as septic systems. The term OWTS gained popularity via the EPA and the Clean Water Act of 1992. Why has the City adopted this OWTS Ordinance? As a matter of environmental safety, is the City’s goal to check all the OWTS systems within the City to make sure they are functioning properly and to find problematic systems before they fail. When problematic systems are located, we hope to facilitate corrective measures which improve system functionality without placing undue hardship on residents. How do I obtain an operating permit application? City Hall is located at 100 Civic Center Way and any available Building and Safety Permit Center staff member can provide the appropriate applications and forms. In addition, all applications and forms are available on the City website www.cityofcalabasas.com. On the homepage, scroll down to the bottom of the page and click on the “OWTS Ordinance and Operating Permit Program” link. I have never had a problem with my system, why does it need an inspection if it is working fine? OWTS’s are located underground and are silent operating systems; therefore, they are usually “out of sight and out of mind.” Because the operation of an OWTS cannot be seen or heard, most systems begin to fail without the knowledge of their owners. Usually, problematic systems have been failing for years but their demise is not identified until there is a serious event. By that time, damage to the environment and the livability of a home cannot be easily fixed. The key to getting the most life out of a dispersal system is by periodic septic tank pumping and other good maintenance practices. The average life span of a dispersal system for a well designed and maintained OWTS system is 20 – 30 years. Why does the City keep stating that OWTS’s cause health or water quality problems? My system works fine and I have never had a problem. When dispersal systems clog, or septic tanks fail, raw sewage and effluent with disease-causing pathogens and nitrates find a path of least resistance. This path frequently is to surface areas such as lawns, driveways and the street where you and your pets are exposed. Other serious problems include contamination of ground water by this untreated effluent. The polluted groundwater then migrates to wells, other water ways and eventually out to our oceans and beaches. What is the cost of an OWTS operating permit? The $85 fee for an Operating Permit has been waived by City Council if it is obtained by May 14, 2010. What is the cost of an OWTS Inspection? The cost of the inspection is based upon the estimates you receive from your Certified Inspector. The City anticipates the average cost to be $500 – $800. However, systems with ready access will be less costly than systems covered by landscaping or other physical constraints. Can I hire a non-registered City of Calabasas Certified Inspector? When do I need to obtain my initial OWTS operating permit? All property owners with an OWTS are required to secure an operating permit by May 14, 2010. What if I cannot afford to have my system inspected by May 14, 2010? The City has a grant program which will provide a reimbursement of up to $500 to low income property owners. In addition any property owner may request a onetime 5 month extension from the building official. Doesn’t the City have plans of my system? What if there are no plans available for my OWTS? While the City has some plans, the majority of OWTS have none. Your OWTS Inspector and/or a licensed professional, can help prepare an “as built site plan” for your system, which is part of your operating permit requirement. Site plans must depict: 1) the type, size and location of the septic tank, 2) approximate size and location of the dispersal system, and 3) basic information about the square footage of your home and the number of bedrooms which the system serves. What is the timeframe from the time I submit an operating permit application to the time I receive an operating permit? The timeframe will depend on: the time it takes the property owner to schedule an inspection with a Calabasas Certified inspector; have an OWTS inspection performed, and for the OWTS Inspector to submit the Certified Report to the City for review. If after the aforementioned takes place, an OWTS that is determined to be functioning properly will result in Operating Permit issuance within 1 to 3 business days. How long will my operating permit be valid, the Ordinance states for up to five years? 1. “System Pass.” Most OWTS’s with System Pass Inspections will result in operating permit issuance with a time frame of 5 years. 2. “System Conditional Pass.” For System Conditional Pass Inspection recommendations that involve repairs that would not result in a System Pass Inspection. For these systems a monitoring program will be required. A monitoring program consists of recommendations prepared by a design license professional that detail how the system can be used despite the shortcomings that prevented a System Pass Inspection. Monitoring programs can include special agreements regarding the actual loading of the system based on true occupancy use (IE widows/widowers sole occupancy,) a pumping frequency plan, and or the intention to connect to an available sewer. Depending on the severity on the conditions which resulted in the conditional pass inspection, operating permit time frames will be established on a case by case basis and be anywhere from 6 months to 4 years. 3. “System Failure.” Systems that fail will not receive an operating permit until a plumbing permit as described above is issued and the system and repair work receives a System Pass Inspection. If a public sewer is available, OWTS’s that are considered System Failures will be required to abandon the OWTS and connect to the sewer. Will the City help me find my system? I don’t know where it is! The OWTS inspector can locate your system. However, it is beneficial to the property owner if they either expose the access lids to the septic tank and or perform any excavation that is required. If the OWTS inspector is required to perform excavations and demolition of hardscaping or landscaping to achieve access, the OWTS inspection will be more costly. In addition, City staff is available to meet with you at your home to explain the inspection process and to help you create a plan in order to make your system accessible and ready for inspection. Do I need to install risers on my septic tank compartment lids? Risers are basically manholes to your septic tank. It is not mandatory for risers to be installed, however, if risers are not currently in place, it is highly recommended to have them installed at the time of exposing the septic tank and/or seepage pit to provide easier access for pumping, maintenance and inspection. The City encourages the installation of risers and no permit or fee is required for their installation. 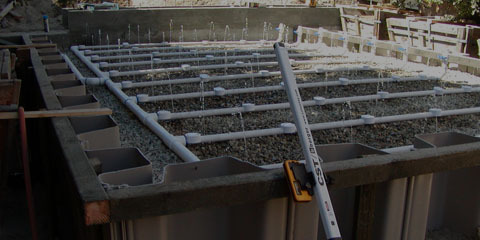 Risers and covers must be constructed of suitable materials and need to be properly installed. My toilet drains slow - will my system pass inspection? Sluggish drainage from plumbing fixtures is an indicator that your OWTS is aging. However, this does necessarily mean that the system will not pass inspection. Simple maintenance to the drain lines may relieve the resistance causing your fixtures to be sluggish. What happens if it determined that my OWTS is a failing or a failed system? Failed or failing systems as defined in Ordinance 2009-262 will require plumbing permits and plans prepared by a design license professional that detail all repair methods. If a major repair is required as defined in Ordinance 2009-262 (IE – a faulty dispersal system,) and the public sewer is available, connection to the sewer will be required. Will my OWTS need to be upgraded to today’s codes? Do I have to connect to the Public Sewer? If a public sewer is available and the OWTS does not pass inspection and major repairs are necessary, the OWTS will need to be abandoned and connection to the sewer will be required. If your system is working fine, you can keep it! What if my OWTS system was installed without a permit? Systems can be granted legal nonconforming status as described via Ordinance 2009-262 Section K1(A)(3)(9). A licensed professional will need to prepare a report and the system will need to be in good working condition in order to obtain the required plumbing permit. What is an OWTS site plan? An OWTS site plan is a basic drawing that depicts 1) the footprint of the property and major structures; 2) the square footage of the major structures; 3) the number of bedrooms in the dwelling/s; 3) the septic tank location; 4) the estimated size (gallons) of the septic tank; 5) the type and approximate size of the dispersal system, and 6) the distance of the OWTS to structures, property lines and any water way within 600 feet. A site plan need not be prepared by licensed professional as long as it is prepared with accurate and verifiable information. To reduce the load into my OWTS, can I divert gray water and allow it to flow freely from the house on the ground’s surface? No. Surface discharging is not allowed. Gray water is defined as any waste discharged from lavatories, bathtubs, showers, sinks, clothes washers and laundry sinks. This wastewater must be disposed of through an OWTS or an approved gray water system. What items should not be put down the drain if my house has an OWTS? Although this should not be construed as a complete list, the following types of items should not be put into sink drains or toilets: hair combings, coffee grounds, dental floss, paper towels, disposable diapers, kitty litter, feminine hygiene products, cigarette butts, condoms, gauze bandages, fat, grease, oil, paints, varnishes, thinners, waste oils, photographic solutions or pesticides. As stated above, these materials clog dispersal systems and reduce their useful life. What can I do to improve the performance of my OWTS? Most OWTS septic tanks need to be pumped every 3 – 5 years. Maintaining good maintenance records will help manage this process. Your OWTS can easily be overloaded. The capacity of your septic tank and dispersal system is based on an anticipated daily load, which is in turn based on the number of bedrooms (persons) in the residence. Many systems were installed years ago, and have been expanded to include additional bedrooms, bathrooms and kitchen appliances which overload older systems. What happens if I refuse to have my OWTS inspected? All property owners who refuse to have their OWTS inspected and secure an operating permit will be referred to Code Enforcement. Although Code Enforcement will attempt to educate the property owner and guide them through a voluntary compliance process, those that are obstinate against the process will be subject to their property being declared a Public Nuisance, substantial fines will be encumbered and the matter will eventually be referred to the City Prosecutor for Nuisance Abatement proceedings and or Civil or Criminal prosecution charges. In some circumstances occupancy may be revoked and utilities may be disconnected and liens may be filed.